Apple’s launch this week of Apple Pay, its m-commerce product, could help finally move millions of mainstream consumers toward the promise of mobile payments, according to media reports. Given that Apple Pay will expose user preferences for payments and sharing data, this is a good time for companies to re-think how they segment their digital consumers, writes Mobiquity president Scott Snyder in this opinion piece. “At their core, digital users are individuals who bring a unique digital profile and set of behaviors to every situation. This new digital world of “Bring Your Own Persona” (BYOP) requires a fundamentally different way of thinking about customers. It used to be assumed that people exhibited predictable behaviors in their public and private lives based on their socio-demographics, allowing firms to use classic segmentation for targeted interactions. Those models are no longer sufficient. Almost all demographics have access to mobile, social and wearables. 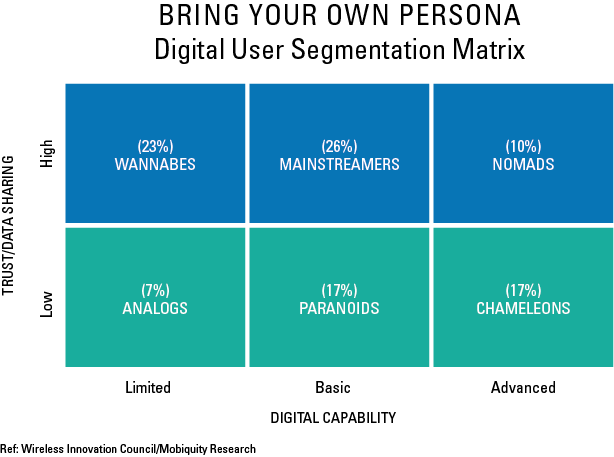 What distinguishes different digital user segments is their savvy in knowing how to use these tools and their comfort levels with the data they are willing to share in various scenarios.